A Great Value! Twelve-pack case of 8-oz. 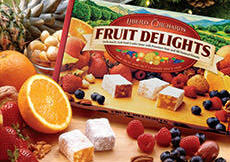 Fruit Delights Assortment including six fruit flavors with Almonds, Pecans, Walnuts, and Macadamias! We take the pure essence of nature's juiciest, most irresistible fruits and blend them with chunks of the finest hand-sorted nuts. 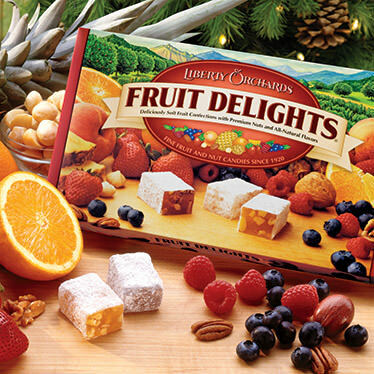 Then we slow-cook the candy to concentrate the brilliant fruit flavors and create our famous silky-smooth consistency with just the right amount of bite! 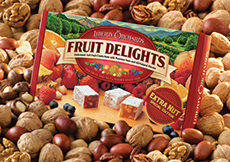 Each box contains six delicious fruit-and-nut flavors including: Blueberry & Almond, Orange & Almond, Pineapple & Macadamia, Peach & Walnut, Strawberry & Walnut, and Raspberry & Pecan. Twelve-pack Case. 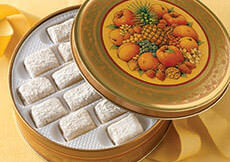 (Gift Wrapping not available on this item) Kosher. 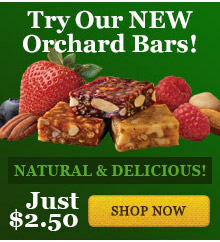 INGREDIENTS: sugar, corn syrup, nutmeats (walnuts, almonds, pecans, macadamias, cashews), modified corn starch, fruit [fruit juice from concentrate (strawberry, peach, blueberry, raspberry), candied orange peel, pineapple, raspberries], pectin (pectin, disodium diphosphate, sodium polyphosphate, dextrose, dicalcium phosphate), natural flavors, sodium citrate, citric acid, malic acid, soy lecithin.